Well, hello, my favourite blogglings of the universe! Today is a post of glorious announcements. I’m doing my monthly recap (which is a bit different to my weekly, but we’ll survive this) and I also have some seriously huge and LIFE CHANGING announcements at the end of the post. They’re mammoth, honestly. Even I’m trembling. 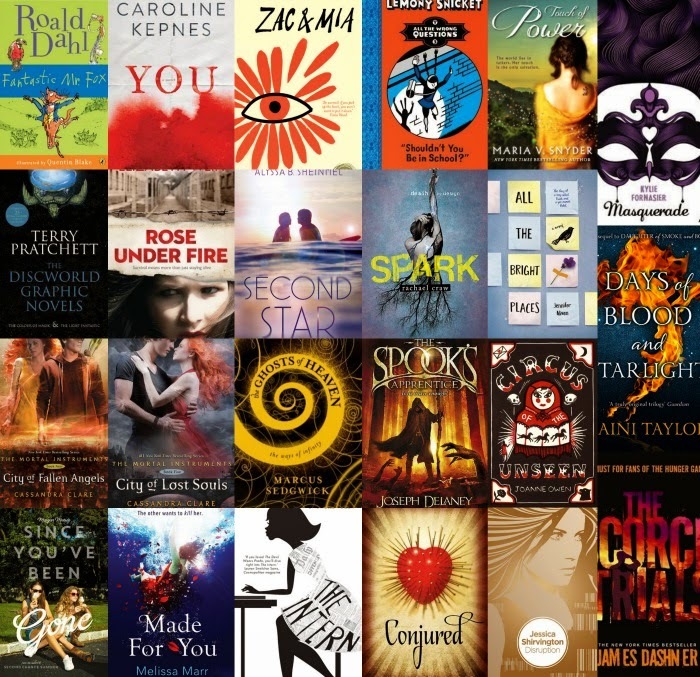 Before we dive in, don’t forget I’ve got 3 copies of Spark to giveaway (Australian only) so enter! Enter! Win! Look at this itty bitty adorable baby pile. I AM SO PROUD. 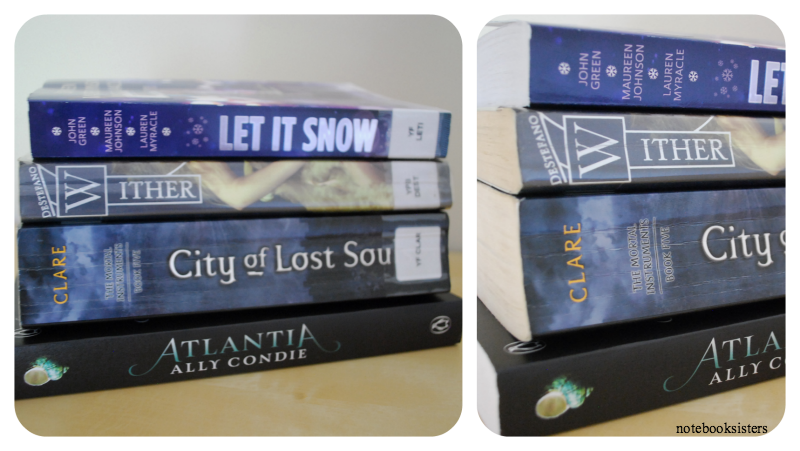 I’m also doing NaNoWriMo, so borrowing two million books is not wise for me at this moment. As you know from my Beautiful Books post, I’m writing a book about a deaf girl and a dead boy. (I foresee relationship problems.) And NaNoWriMo is officially in swing! I’ve got my first 2,000-words down…only 48,000 to go. I also happen to be going away for the last week of November. So, yes. 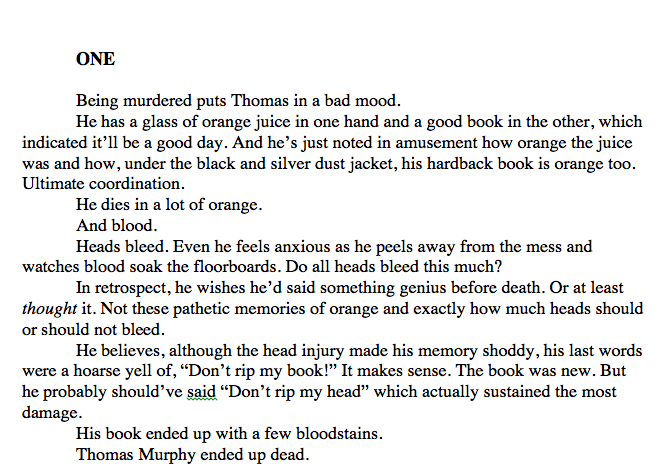 I’m writing speedily. It should be incredibly interesting. I Read A Few Books This Month. About 23 Of Them. Best book? This is hard! I had like seven 5-star reads!! But it has to go to All The Bright Places. I will never recover from that painful book of wonderfulness. Notably awesome? The Scorch Trials and Disruption and City of Fallen Angels and City of Lost Souls and Rose Under Fire AND Since You’ve Been Gone all got 5-stars…so. They are awesome. Wish I’d never read? Prize of this goes to You (which I technically only hafl read) and Touch of Power. Did I laugh? Um, YES. Almost embarrassingly so. I laughed my head off reading Disruption….but the trouble was, I listened to it on audio when I went walking. So I was the weirdo walking down the road laughing to myself. Most eaten genre? 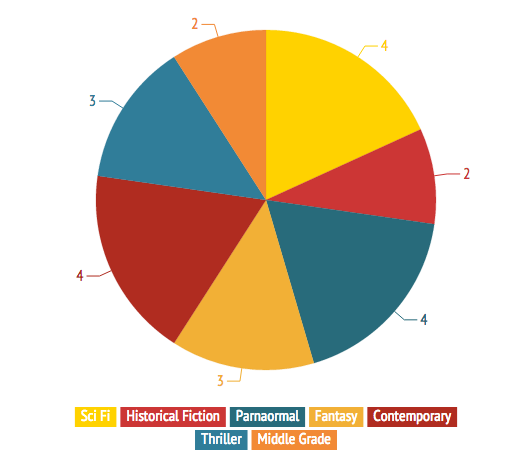 I didn’t read quite as widely as last month, but 7 genres isn’t too shabby, right?! Contemporary, fantasy and paranormal all tie for 4 books each. Ratings? Was I just super easy to please this month?! HOW ON EARTH DID I GET SEVEN 5-STAR RATINGS?!! 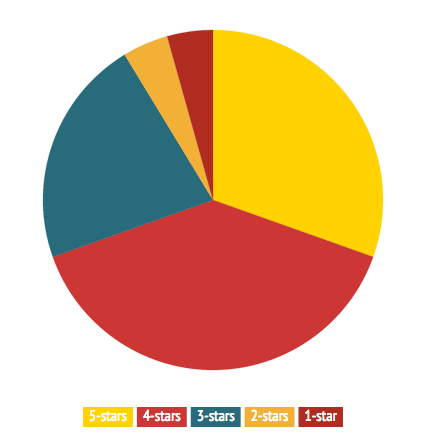 And 4-stars wins overall…so I’m pretty happy! Stoked in fact. Bring me some pie and let’s party! On The Blog, This is What You Blogglings Loved. – Social Media: Do We Really Have To Do It All? Hmmm…nope. I basically read the entire of the month. But in my defence my small overlords abandoned me for 3 weeks so I was very lonesome. I ate a lot of books, wrote a lot of words, annoyed Mime…normal things. I did draw this month though, because zentangling is fun. Across the Internet Things Went Down. John Green vlogged about the Paper Towns movie! Marvel kindly gave us a schedule of their next 9 movie release dates. Daniel Radcliffe is no longer The Boy Who Was Harry Potter, but can rap, very very fast. Darren Groth (author of Are You Seeing Me? and who I interviewed) has a book deal for AYSM in USA and Canada! So you guys will all be able to read his awesome book!! HUZZAH! Kristen @ My Friends Are Fiction asks if you rate books higher when you cry? Allie @ Little Birdie Books is writing a book! Inge @ Bookshelf Reflections did the book blogger tag. Imogen @ Gossiping With Dragons did a series on NaNo posts and introduced us to her WIP! Kara @ Diary of a Teen Writer has a new gorgeous bookshelf and I love it and secretly covet it. Emily @ The Loony Teen Writer doesn’t believe in guilty pleasure books. The Book Chewers are back in action with ways to ruin a notebook and discussions on title lengths. Nara @ Looking for the Panacea had an awesome quiz on chapter headings! DRASTIC AND SOMEWHAT SCARY NEWS! OKAY! Time to spill all the beans. Although if you a) follow me on twitter or b) have looked at our updated header go on, do that now if you haven’t, then you probably know what I’m going to say. Notebook Sisters is changing it’s name and moving to wordpress! I explained a while ago that my sister (and co-blogger, obviously) can’t blog anymore. She’s too busy with school and music and being fabulous, SO, that leaves me very awkwardly with a blog name that needs both of us. I have brainstormed seriously for names (and bothered Lydia incessantly with ideas…she was very patient with me) and I’ve made the decision. I knoooow, it’s going to be terribly hard to get used to and also it’ll be weird. You all know me as Notebook Sisters, right?! It’s my username EVERYWHERE. But this will all (slowly) change to Paper Fury. When the move is done, I’m going to have a small party and large giveaway. Because parties are fun (cake included, obviously) and giveaways are even more fun.